A lesson in product naming conventions: your first generation should be something with no easily discernable relationship to the item, like Nabaztag, the ambient Wi-fi rabbit gizmo. Subsequent generations should further complicate the already mysterious name, like Nabaztag/tag, the older and wiser version of said rabbit. You may remember our coverage a few weeks ago in which we discovered that people weren't exactly falling in love with Nabaztag. We would like to reconsider that notion and welcome our new long-eared overlords. 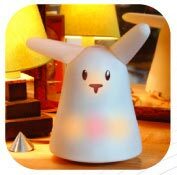 The new bunny is equipped with smell detection, so it can detect individual scents (like fear) and take an appropriate action (going for your jugular). They've also removed the 45-second speech limit, so your lagomorphic companion can serenade you all day long. $179.95 for a soul-eating rabbit? That's a steal!